Gary and I headed to explore the Bay Area city of Benicia, CA. We had heard from a co-worker it was a lovely and friendly town with lots of good antique shops. The weather was gorgeous with sunshine and not too warm at all with highs around 68. Benicia is about 35 miles from San Francisco so the drive was smooth and easy. Upon entering Benicia, it almost feels likes you are going a back in time as there are the cutest cottages, Mid-Century homes and lots of beach-town architecture. The city is so clean and family friendly and they have the ‘green’ with stunning gazebo and of course First Street which is like Main Street in another cute town. First Street is lined with cute shops and restaurants and I have never seen so many hair salons, spas and real estate offices on one street!! It is also incredibly family friendly and nearly everyone we passed had one or multiple dogs so it is also a very pooch friendly city. 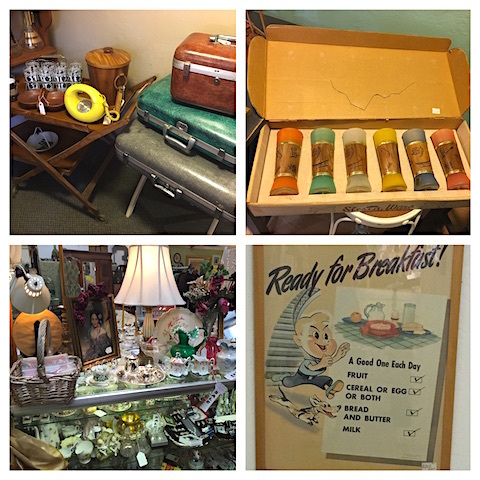 We explored 5 antique shops and there were a few more too but already closed by the time we wandered by. Most of the antique shops are pretty small but there was a larger multi-dealer mall so we stopped there first. 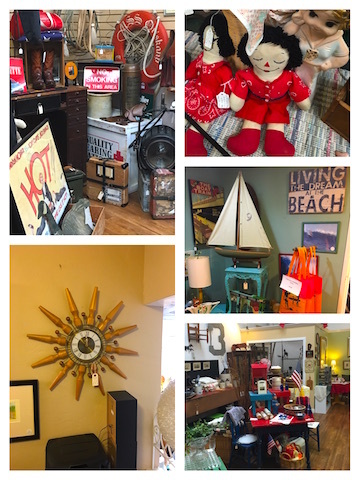 Benicia Antiques Mall has about 20 dealers and they sell a variety of cute collectibles and even one or two Mid-Century goodies. Lots of Depression glass, decorator items, mixed in with some collectibles. There is an upstairs also so don’t miss it as there are a couple dealer rooms located there. The pictures you see here are from this mall. Prices at this mall are on the higher side so keep that in mind. We stopped into a couple other antique shops and they too had the usual glassware and china, some kitchen collectibles, records, books, Asian artifacts and kitchenware too. Prices are on the high side at many of the shops but there are deals to be had if you look. 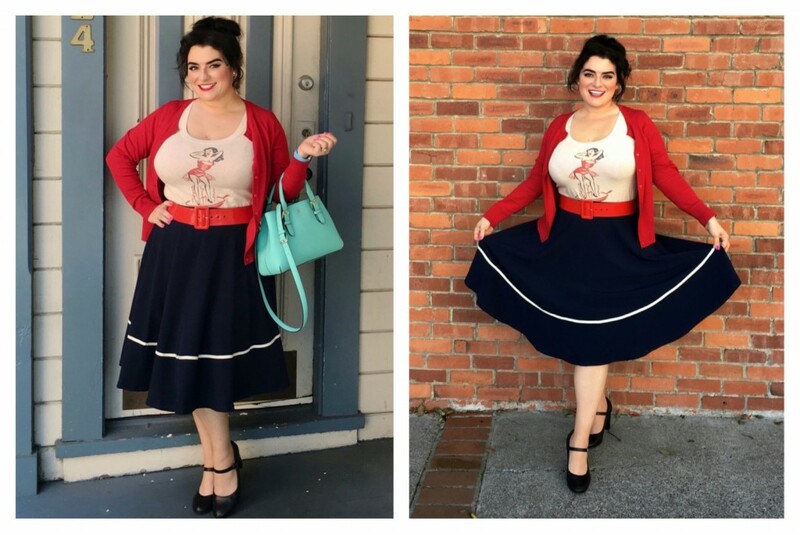 What would a Pinup wear when antiquing in the town you ask? Well, I wore my Mischief Made ‘Hot Tamale’ t-shirt and paired it with my Steady Clothing swing skirt and a red cardigan w/ matching red belt. Comfy but stylish with Pinup flair. I don’t much talent for hair so; I put it up in a bun and did my winged eyeliner. I am totally obsessed with my turquoise blue Kate Spade purse hubby gave me for Valentines Day so it goes everywhere with me. We highly recommend a day trip to Benicia, CA. It is a town that is beyond cute and you will surely enjoy yourself. You will even catch glimpses if the sea! !